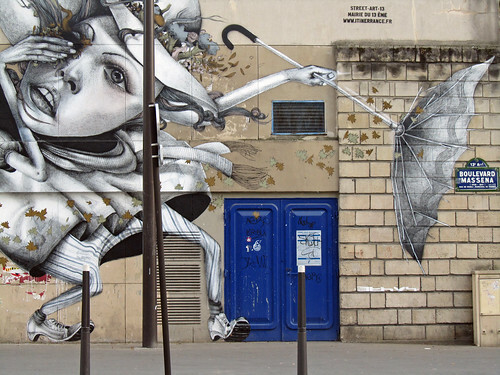 Have I ever told you just how varied Parisian street art can be? From simple spray can graffiti variety to stencils to truly thought-provoking pieces, they never cease to amaze me. And there are a lot more street arts that I haven’t yet spotted so far. I term this Alice-in-Wonderland-esque as “Blown away” and if anything, it reminds me much of Ireland, where windy days are not rare and nobody even bat an eyelid at “inside out” mushroom umbrella. Some day, on Grafton St, there is even a street artist/mimer there who stands at his spot with tie blowing away from him face and him struggling with his weather-sensitive umbrella. I may have his photo somewhere – if I find it, I’ll update this post accordingly. it depends, this one is actually commissioned by the city council of the 13th arrondissement (the tiny black letters on top right corner says so) but really, people here are more likely to see it an expression of art and taking the freedom of expression in their hands than defacing buildings/structures etc.